The question of how individuals in a population organize when living in groups arises for systems as different as a swarm of microorganisms or a flock of seagulls. The different patterns for moving collectively involve a wide spectrum of reasons, such as evading predators or optimizing food prospection. Also, the schooling pattern has often been associated with an advantage in terms of energy consumption. We use a popular aquarium fish, the red nose tetra fish, Hemigrammus bleheri, which is known to swim in highly cohesive groups, to ana- lyze the schooling dynamics. 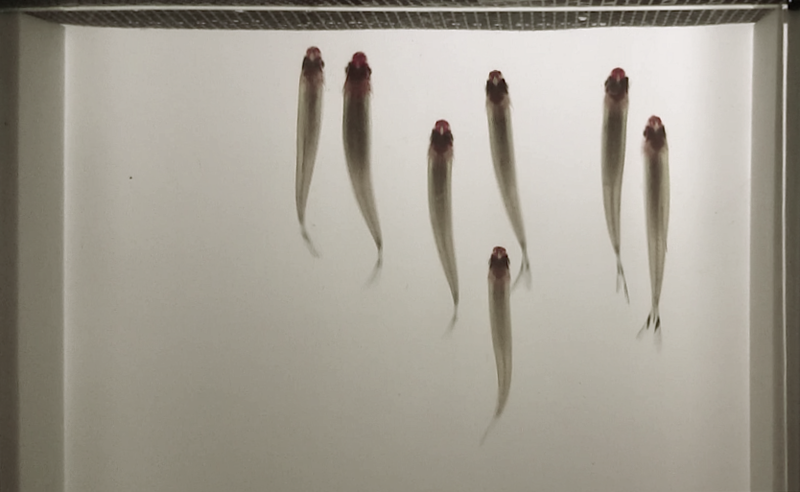 In our experiments, fish swim in a shallow-water tunnel with controlled velocity, and stereoscopic video recordings are used to track the 3D positions of each individual in a school, as well as their tail-beating kinematics. In a first paper (Ashraf et al. J. Roy. Soc. Interface, 2016) we study to the basic interactions and cooperative swimming of a single pair of fish. We first bring evidence of synchronization of the two fish, where the swimming modes are dominated by ‘out-phase’ and ‘in-phase’ configurations. We show that the transition to this synchronization state is correlated with the swimming speed (i.e. 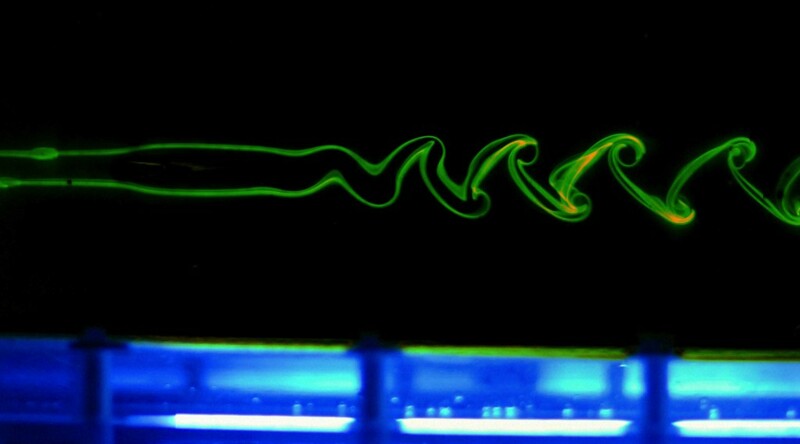 the flow rate), and thus with the magnitude of the hydro- dynamic pressure generated by the fish body during each swimming cycle. From a careful spatio-temporal analysis corresponding to those synchronized modes, we characterize the distances between the two individuals in a pair in the basic schooling pattern. We test the conclusions of the analysis of fish pairs with a second set of experiments using groups of three fish. By identifying the typical spatial configurations, we explain how the nearest neighbour interactions constitute the building blocks of collective fish swimming. A second paper (Ashraf et al. PNAS 2017), we challenge the widespread idea of fish favoring a diamond pattern to swim more efficiently [Weihs D (1973) Nature 241:290–291] by observing that when fish are forced to swim fast—well above their free-swimming typical velocity, and hence in a situation where efficient swimming would be favored—the most frequent configuration is the “phalanx” or “soldier” formation, with all individuals swimming side by side. We explain this observation by considering the advantages of tail-beating synchronization between neighbors characterized previously. Most importantly, we show that schooling is advantageous as compared with swimming alone from an energy-efficiency perspective.